A mechanical or physical shock is a short and sudden acceleration or deceleration caused, for example, by impact, drop, kick, or explosion. Shock testing is performed to replicate day-to-day events that products or equipment encounter during daily operations or transit. ITC Engineering Services has the capabilities to perform a range of shock tests including: Transient, ½ Sine, Saw-Tooth, Triangle, Rectangular, Trapezoid, Haversine, Sine Burst . 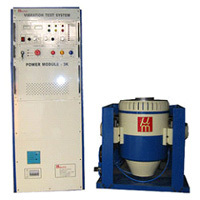 Thermal shock tests are performed at the most severe ends of the temperature scale. The product or equipment is subjected to a very high rate temperature change. Thermal shock test is often performed on packaging material, military electronics and aircraft parts.